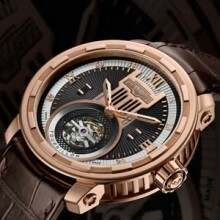 TWENTY-8-EIGHT TOURBILLON – 100% MANUFACTURE! With the Twenty-8-Eight Tourbillon, first released in 2010, DeWitt took a major step forward as the calibre DW8028 was its first entirely home-made Tourbillon movement. A landmark in the history of the brand showcasing yet again the depth of its know-how and its autonomy. This year, DeWitt is releasing its second 100% Manufacture movement with the DW8014. A stunning automatic Tourbillon with a peripheral oscillating rotor, a dead-beat second, and a patented Automatic Sequential Winding (A.S.W.) system. The DeWitt calibre DW8028 is a manually wound movement integrating a solid and reliable Tourbillon mechanism. Its construction is rather classical, using age-old and recognized technical parameters as a basis: 18’000 A/h, 72 hours power reserve. The movement is equipped with a Swiss anchor escapement with a variable-inertia balance and a spiral with a Breguet curve sequenced at 2.5 Hz. The balance, as well as the escape wheel and the anchor are made of 18 carat yellow gold. Spiral with Breguet curve sequenced at 2.5 Hz. 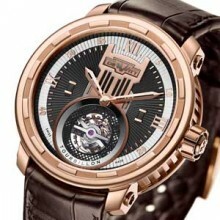 Central construction composed of columns and opening up into a large circle embracing the Tourbillon movement. Semi-transparent grille reducing the opening. Large radiating sunray pattern divided in two colour tonalities. Rhodium or Palladium circular applique at the perimeter on which Roman and Arabic numerals are placed. Two “children” appliques at 3 and 9 o’clock.